Organizing all the materials used for teaching an entire year of school is something we all struggle with. I have created two different kinds of charts for organizing all your teaching materials for the Common Core. Just print out whichever chart you would like to use and attach it to the inside of a file folder. 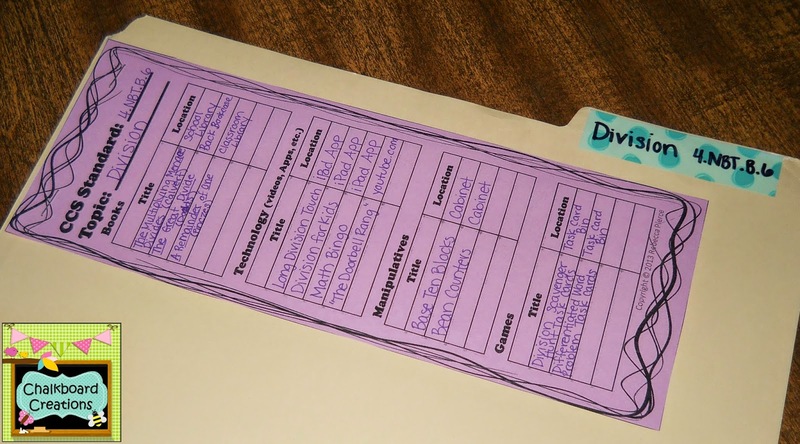 Then you can record any books, manipulatives, technology, or games you can use for teaching that particular standard that (obviously) won’t fit into the file folder. Then as you go to plan your lessons, you have a list of resources. Here is a picture of the charts in action! They really help in keeping all your resources for each topic organized. Hop on over to my TpT store today to download it for FREE!